Celebrate your wedding on the romantic shores of Leith; our picturesque and idyllic location is the perfect setting for your big day. The warm and welcoming atmosphere of the Granary will provide you with a special day your guests won’t forget, for all the right reasons. The Granary has a stylish reception area for up to 50 guests; the Mezzanine can also seat parties of up to 40 for lunch and dinner. The bar opens to the outdoor waterfront seating area in summer, warm and welcoming with its open fire in winter, our bar serves a range of premium ales, wines and cocktails. 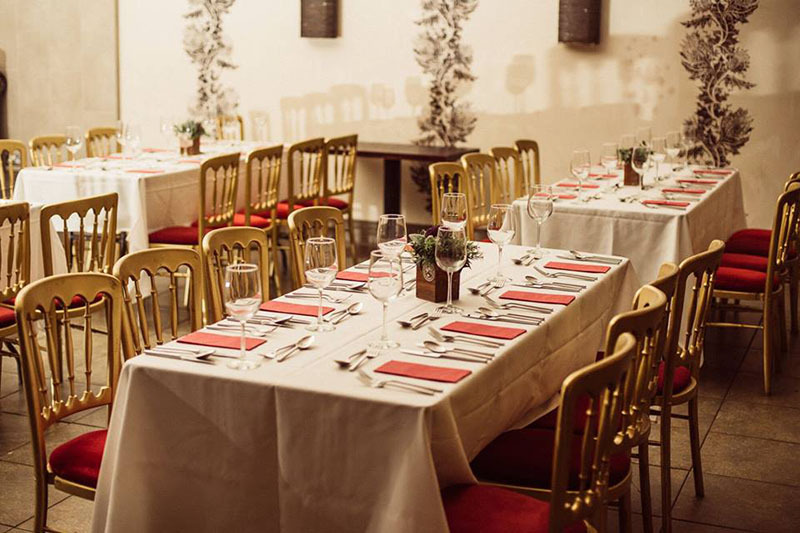 Our private function room, the Jig Room, is the perfect place for a wedding party. This space has ample room for up to 150 guests, private bar, DJ booth, projector screen and large stage. We can include the services of a DJ or band, or bring your own… it’s your day! I cannot express highly enough how wonderful the staff at the Granary were in the run up and on the night of our wedding party in their Jig Room. Elaine in particular was so helpful, meeting with us regularly to check details, and being very flexible of our requirements. On the night she was a star, I never once worried that people weren't getting good service. The quality of the food was also great (and very generous sizes). The Jig Room itself is fantastic for a party, with private bar, stage and music system. You can bring in a band (thoroughly recommend the Aye Dhus if you want ceilidh / covers) or you can also plug your phone or iPod in. We had 100 people and it didn't feel overly crowded. The mezzanine is also great for an early drinks reception to greet people as they arrive. Thanks so much to all the team for giving us a magical and really fun wedding!! We held our pre-wedding party at the Granary and could not have been happier with the venue, the food, and the staff's help. They were super accommodating and helped us throw a fantastic event. The food which served over 100 people was great and presented beautifully. Highly recommend for an event, or just a meal/ evening out with friends! We decided to hold our evening bash for our wedding in the Jig Room. The Events Manager (Elaine) was great, really accommodating and friendly so we pretty much had free reign on what we could do decoration wise (including fairy lights, candles and a photo booth). This was the perfect venue for us at the right price, there aren't that many places in Edinburgh that will take people without going down the whole package route including wedding tax so if you are looking for a space that will hold up to people this should be a serious consideration for you. My husband and I had our wedding reception at The Granary for our party of 18. From day one Elaine was so helpful (with a very nervous bride!!). She was in regular contact regarding menus and how we would like their upstairs room to look for our reception. When we arrived, the room looked stunning! Every member of our family commented and complimented how perfect the food and service was throughout. From the bottom of mine and my husband’s heart, thank you! Because it honestly was perfect! !